As a (too) frequent traveller, I'm always on the watch for the latest technology in air travel comfort. 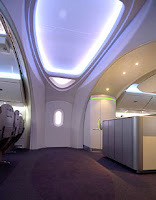 I was excited enough when I experienced the A380 Airbus (see article) "super-jet" first-hand, but have been beside myself waiting the availability of flights on Boeings newest baby, the 787 Dreamliner, which was scheduled to have it's first test flight this year. The latest nightmare for Boeing in the Dreamliner venture has been caused by labour issues. A delay in the maiden flight of the plane will most likely push back the first deliveries to early 2010. The Dreamliner project was first kicked-off in 2004 with a record order from All Nippon Airways. Now the Japanese company will not receive delivery until the first quarter of 2010 - about two years later than promised. On November 4, Boeing announced that it would need to postpone the first test flight of the Dreamliner because of issues with fasteners, as well as the effects of a 58-day machinist strike. At the time, Boeing provided no new forecast on how long the delays were expected to last. 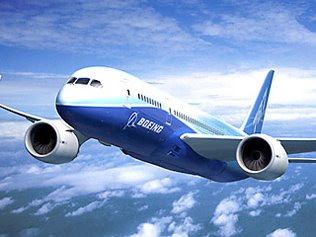 There is a real chance now that customers could well ask for compensation from Boeing to satisfy the late deliveries. The Dreamliner is Boeing's first new model aircraft in more than a 10-years. The key competition of course is the Airbus A380. Both companies are suffering from downturn in demand in the aviation market as a direct result of the global financial crisis. Oh well - in the meantime, I'll just keep looking at the pictures and videos, and 'dream' about flying on this 'state of the art' aircraft.